What does it mean to be LGBTQ? The acronym used to describe non-heterosexual and non-cisgender people (lesbian, gay, bisexual, transgender, queer) has been found in this form since the mid-nineties. Many more inclusive variants exist, such as LGBTTQQIAAP ((lesbian, gay, bisexual, transgender, transsexual, queer, questioning, intersex, asexual, ally, panssexual), but LGBT remains the most widely known. LIFE GOES BY TOO QUICKLY tries to take a step past the pressure to conform to the categories of the acronym; towards freedom and fluidity of identity. 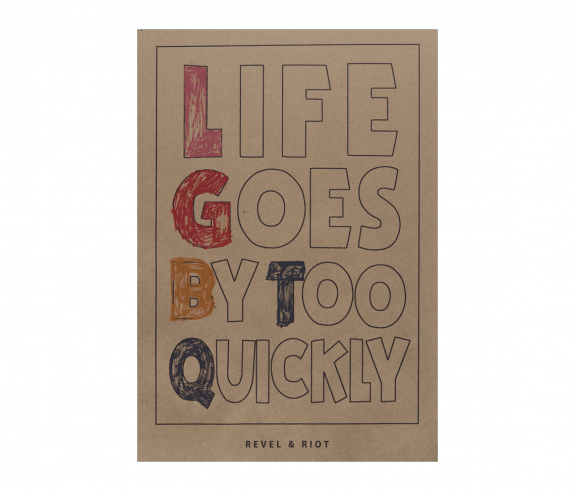 But mostly, LIFE GOES BY TOO QUICKLY is about the wastefulness of hate, discrimination and injustice. It's a phrase to sum up the collective exasperation of LGBTQ people and allies who want and end to inequality, bigotry and enforced normativity. 13 x 19" poster on 8PT 100% Recycled Brown Kraft Paper.